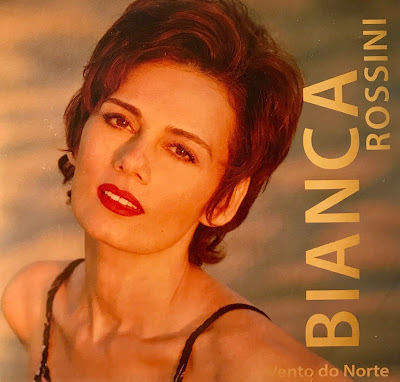 CD Review: Bianca Rossini, "Vento do Norte"
A couple of months ago, I received an email from Bianca Rossini informing me that she had just published a new CD. She offered to send me copy of her CD with a request that if I liked it, would I do a review for my Music Man Blog. After some research, I agreed to listen to the CD and do a review if I like it. I received the CD several weeks ago, have been listening to it and it's terrific. Bianca Rossini was born in Rio de Janeiro and sings with a very sensual style that fits beautifully with the traditional Bossa Nova style. In addition, Bianca is a skillful lyricist and composer. On her latest CD, "Vento do Norte", Bianca wrote all the lyrics for the 10 songs on the CD and also co-wrote the music for 3 songs. It's such a pleasure to hear new songs written in the timeless Bossa Nova tempo. With respect to all the great Bossa Nova masters who have delighted us with their music in the past, Bianca brings something new and fresh to the Brazilian Bossa Nova. She sings in Portuguese and the lyrics she has written are outstanding. Bianca Rossini has an impressive resume including success in TV and Film. She is a dancer and choreographer and the author of three books. She co-produced and hosted a decade-;long weekly television talk show, "The Bianca Rossini Show". "Vento do Norte" is Bianca's third CD and if you are a Bossa Nova fan, you will enjoy her new CD. 6. "Tic Tac do Amor"
7. "Paris in Beverly Hills"
I found a "YouTube" of Bianca Rossini singing the last song in her CD, "Coracao de Ouro" and I know you will enjoy listening to it. Wednesday night at AJ's is usually covered by Doug MacDonald. However Doug couldn't make the date, so he asked Piano marvel, Rich Bono to stand in for him. 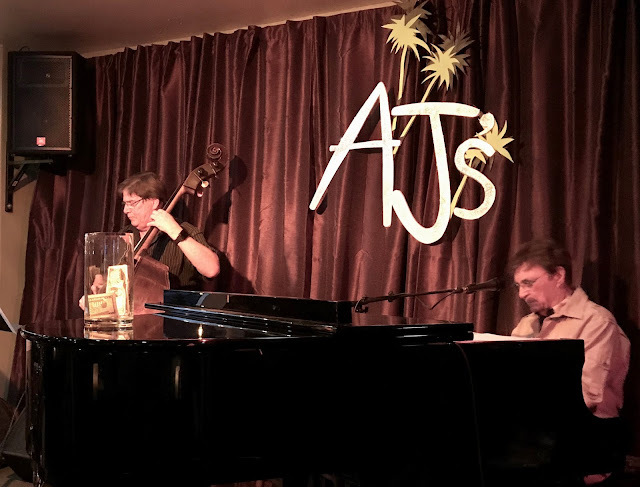 Rich was joined by Bassist Larry Holloway and Drummer Tim Pleasant and these three master-class musicians put on one of the best musical shows of the season to the delight of the capacity audience at AJ's. 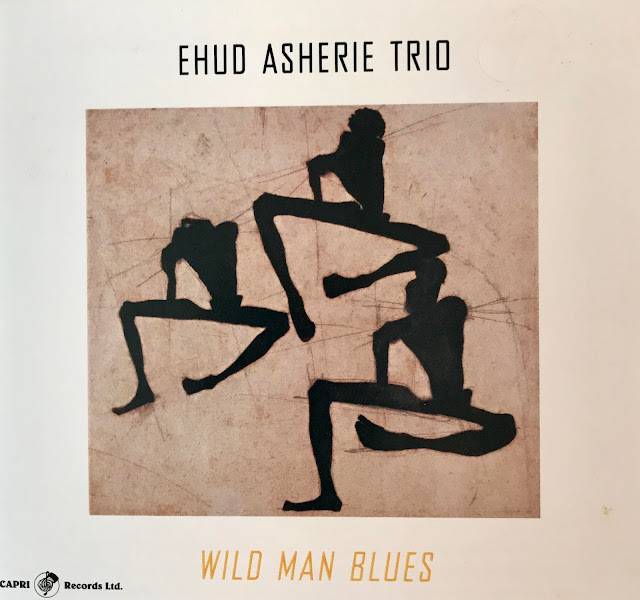 Rich wasted no time tonight launching this Piano Jazz Trio into 4 great up-tempo standards, one better than the next. Rich was at the top of his musical game, as he usually is, and inspired and excited the audience. It appeared that Rich's outstanding Jazz Piano playing also inspired Larry and Tim, who not only performed well, but looked like they were having lots of fun doing it. Before long the room took on a party feel as the Trio had totally engaged the attention of the audience. The first set flew by and when it was over, the audience was on their feet cheering. During the second set, several talented vocalists who I am familiar with, sat in with the Trio . They too were inspired by Rich and his Trio and responded with some of the best musical performances I have witnessed in the Valley. It was a special night for all! 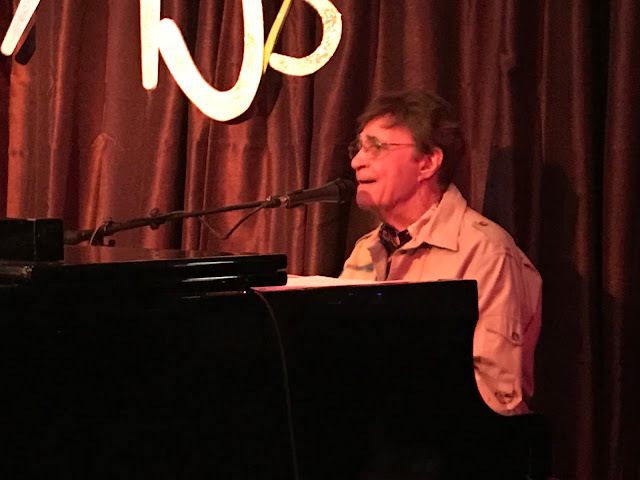 Rich Bono has a sterling musical resume including several tours with Frankie Lane and the Harry James Band. He has performed in many of the finest casino Hotels in Las Vegas for over 30 years where he performed with some of the biggest stars in the country. Sadly, we just don't get many chances to hear Rich play with a Jazz Trio. When he does, he creates musical magic! I was able to record a short video on my iPhone which I posted on "YouTube" that will give you a taste of what the music sounded like on this special night.